You guys!!! We have one week left until the reveal and, up until this weekend… I was seriously wondering if the reveal was going to happen over here! There was a minor hiccup with me and sledding earlier this week which resulted in a trip to urgent care. That resulted in no DIY work for me until my hand is better. So, this gal was majorly stressed but my awesome hubby saved the day. So, progress this week is thanks to him. This post is sponsored by HANDy Paint Products. Play catch-up if you missed Week 1, Week 2 or Week 3! I’m excited to be able to work with HANDy Paint Products this year and for this project. 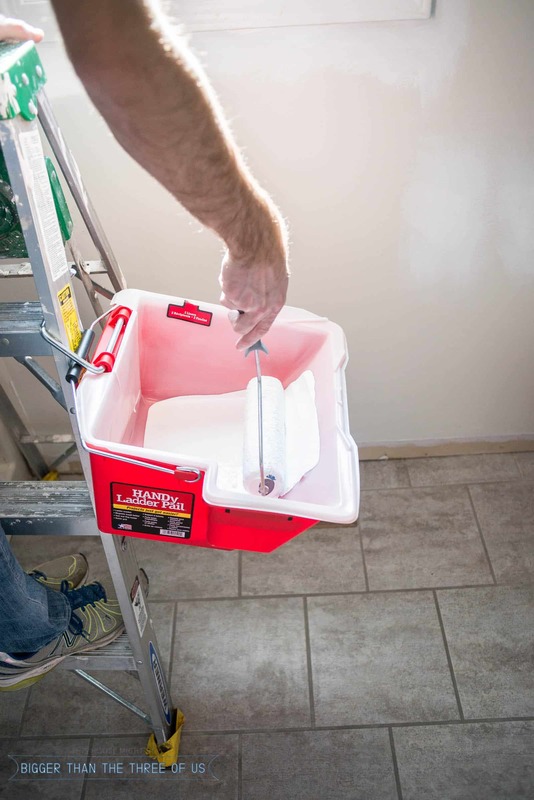 We were able to try out the HANDy Ladder pail. It can hold up to a gallon of paint (how cool is that?) and attaches to most extension and regular ladders. Painting in our bathroom didn’t require a huge ladder because it has 9ft ceilings, but how the pail attaches to the ladder is so cool. 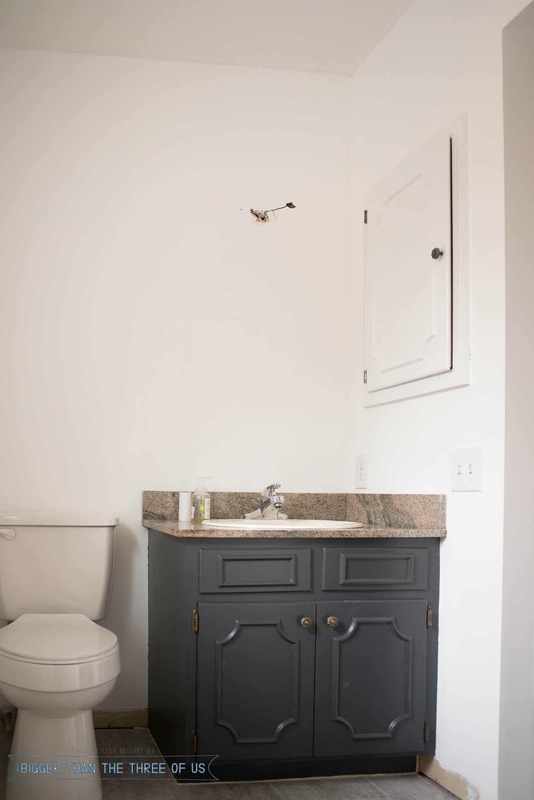 It made the job super simple and has me dreaming of how easy it would make painting our entryway (with 20ft ceilings). 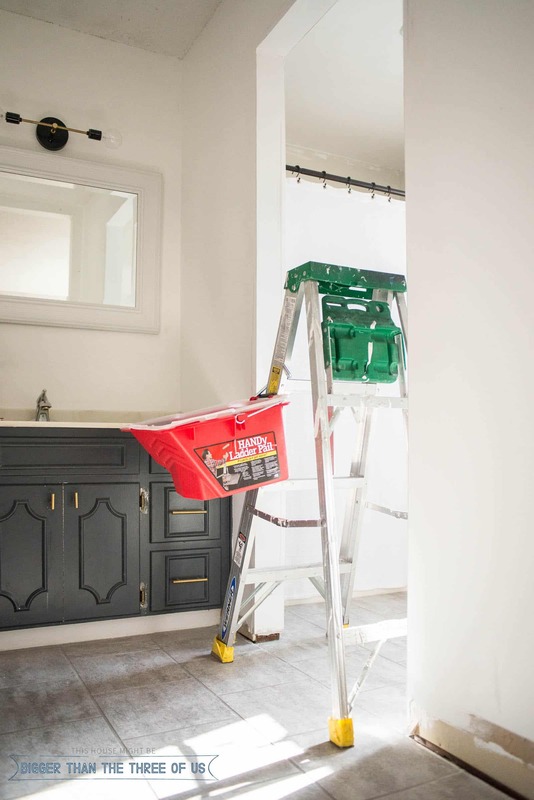 I’m usually that person – the one who’s going up and down the ladder while rolling because I have to load my roller and I don’t trust myself to put a tray on the foldout ladder ledge. 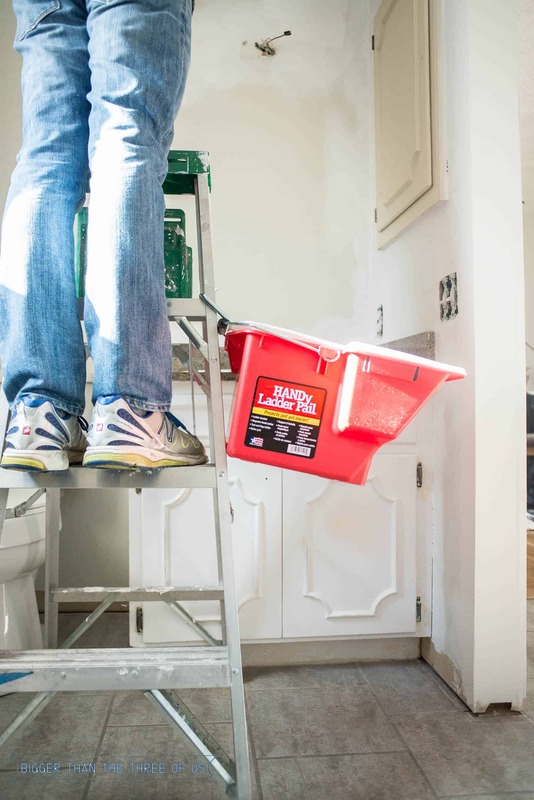 The ladder pail solves that problem because it’s incredibly sturdy. So, my awesome hubby painted his heart away on Saturday and it looks so incredible. The walls are Ultra White by Valspar and the vanity is Cracked Pepper by Behr. I did color-match the Cracked Pepper to Benjamin Moore Advance which is my favorite paint for wood. Btw, if you are curious about more tips and tricks for painting, check out Episode 2 of my podcast! 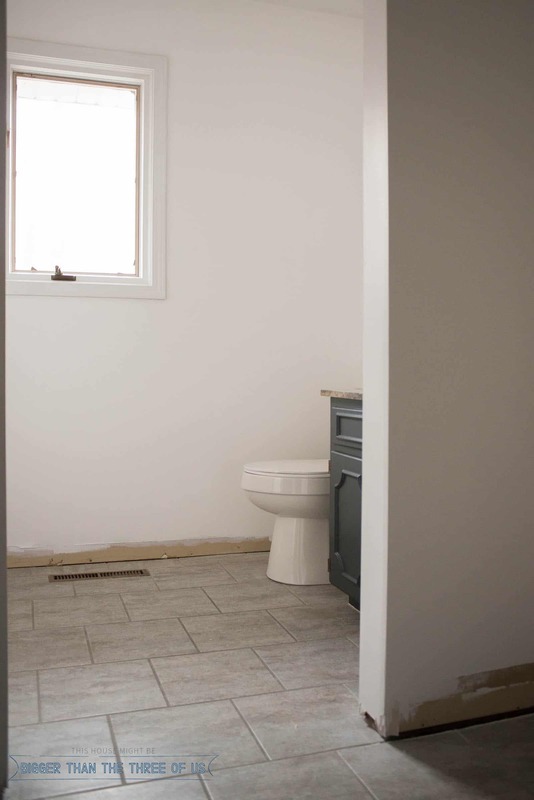 As you can tell, we still need baseboards but… the POWER OF PAINT! Wow! One thing that we didn’t talk about on the podcast was the BEST way to save time while painting. When I got my HANDy Ladder Pail, I was a bit worried that my way to save time wouldn’t work with it because it’s a good size but… it works! Ha! 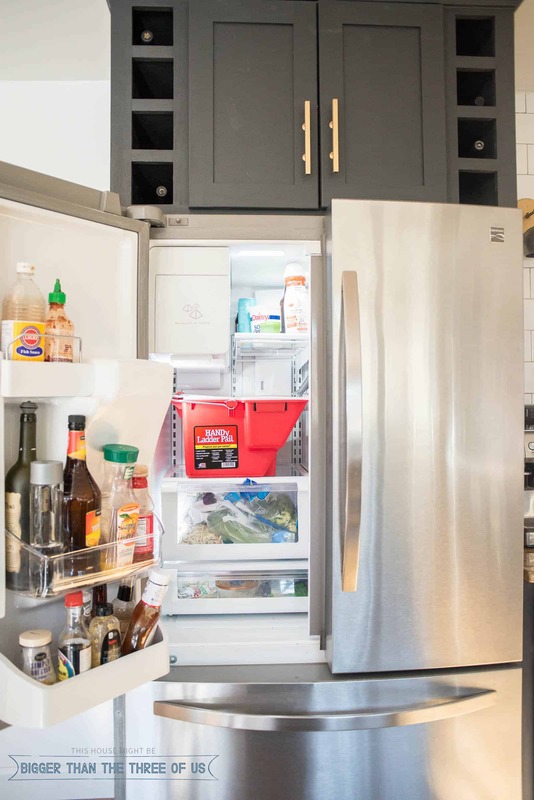 If you didn’t know this already, stick used paint brushes in a ziplock bag, cover paint trays or pails with a trash bag and stick it all in the fridge. 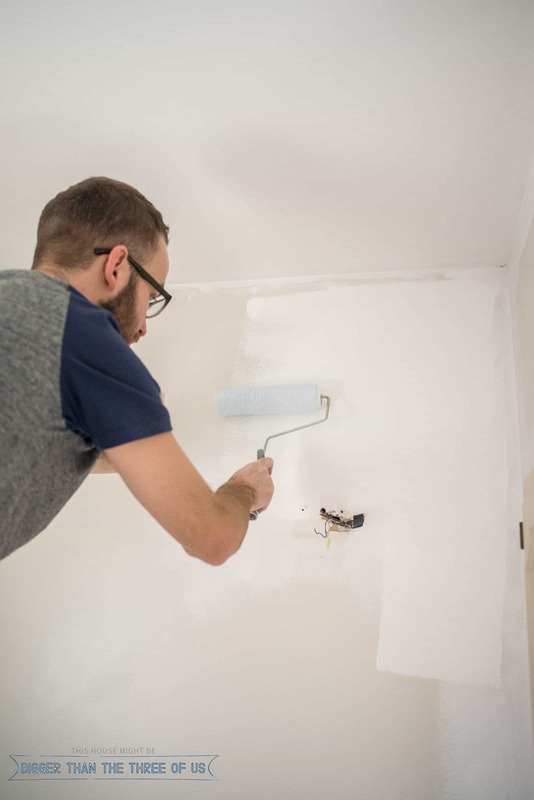 This will save you time by keeping everything wet so you don’t have to clean your brushes, liners, rollers each time when you are painting a room. I leave my products in the fridge for up to a week and they are great! Make sure to check out all the other rooms in this challenge!